HJ: Dr. Wayne Dyer outlines the three stages of spiritual awakening based on his decades of study and spiritual practice. An interesting read for sure. The universe is complete and perfect. There can be no mistakes. Nothing is random. The entire “onesong” is exquisitely synchronized. To understand synchronicity and to implement it, we are required to suspend some of our old ideas, to give up our notion of coincidence, of mistakes, our belief that people are imperfect. The principle that every single event and every single person is connected seems almost too much to accept. Most of us would rather hang on to the “principle of randomness” and “error.” We seldom consider that everything within our perfectly operating universe may also be operating perfectly. It appears easier to believe that unexplainable coincidences occur for no reason. The fact is that the more we loosen up and allow ourselves to flow in the energy system of the universe, the more we experience this phenomenon. Ultimately, we cease being surprised by these happenstances and recognize them as part of the mysterious perfection of our existence. I would bet that you have had the experience of absolutely knowing who was calling on the phone before you answered it. I would also wager that you have found yourself doing something that you had never done before and were unable to explain why you were doing it until later when you could look back and clearly see the reason. There is a rhythm to the universe. When we are able to get quiet enough, we experience how we are a part of that perfect rhythm. Thoughts contemplated as energy are hooking up not out of coincidence, but because we are both the source of thought and a part of universal thought. The ability to be thought and create thought gives us the ability to make virtually any connection to thought that we choose. As we awaken to this probability, coincidences no longer are surprising. Before long, we come to expect them. All then trans-form-ation, as we are able to create them at will. As I explain in my Free Video Series for Awakening to Your Life’s Purpose, acknowledgement of synchronicity in our lives nurtures our divine connection to the invisible, formless world. It allows us to begin the awakening process and to see that we can use our ability to think and be thought, to reshape and redirect our entire lives. Stage One: Your beginnings on the path. Remember when your heart was broken and you felt that you would never get over the trauma? Your mind probably seemed to be working against you because of your endlessly painful thoughts of how miserable you were right then and how awful the future seemed. Perhaps it was a romantic crisis, a divorce, a financial disaster, an illness, an accident of some kind. You were unable to view it with hindsight. The experience of a crisis immobilizes us for a long period of time. Our mind is focused on the disaster aspects of the situation, and we are unable to function effectively. We are unable to sleep or eat, and do not know how we are going to get past the terrible set of circumstances. We use our minds to focus on what is wrong, how painful it is, and how terrible it is going to be in the future. Advice from friends and relatives seems unrelated to our problem and usually results in anger and frustration. We cannot see any way out of our misery. This is a typical response for all of us who are traveling our life paths in the belief that the external signposts are all there is to our reality. We cannot imagine that there is a valuable lesson in the trauma. We reject any suggestions that someday we will recall this experience as a necessary step in our development. We simply want to wallow in our hurt, believing that someone or something outside of us is creating this pain, and wishing that those externals would change. All of us at this point on our personal journey of awakening are possessed by our traumas. We truly believe that the events are making us unhappy, and have not yet learned that we are stranded in the misery by the way that we are processing the events. We are unable to consider that there may be a gift in the unfolding drama that is our life in the moment. Stage Two: The middle ground. 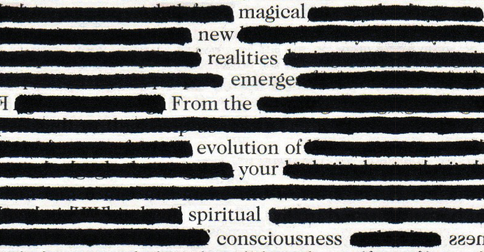 As we become more awakened, we use our power to create our world through thought in a much more transcendent way. Looking back, we almost always see the benefit to use. The divorce that we thought we would never get over now seems to be the best thing that ever happened. Youthful crises which felt life-threatening at the time now seem a natural part of our development. The bout with alcohol addiction that was ruining a life is now viewed as the most important thing ever experienced – it taught how much strength was really deep down inside, even though days of drunkenness seemed to destroy all that was important at the time. The bankruptcy is seen as the necessary catalyst that caused the shift to a more rewarding way of life. The severe illness is recognized as the message to reexamine priorities and slow down. Hindsight provides new eyes to see the opportunity in what was happening at earlier stages of life. This is an important step in the enlightenment process, and helps us to see how synchronized the onesong really is. Certainly we still experience the pain and suffering, but we simultaneously know that there is something magnificent in this as well. We are able to be gentle and accepting with ourselves, and to honor and love even the part that is creating the crisis. We probably will not cognitively understand why this pain is occurring right now, but we will have an underlying knowingness and belief in the value of it. Stage Two, then, involves being in the present moment with everything that we are experiencing, rather than having to spend long periods of time suffering before we realize the blessing inherent in the struggle. When we can seize that higher something in the moment, we are advancing along the path toward that third and ultimate stage wherein pure synchronicity lies, and where we take a much more active role in co-creating our world. Stage Three: Pure synchronicity. If Stage One of enlightenment is to notice with the benefit of hindsight that every obstacle is an opportunity, and Stage Two is to catch ourselves as the obstacle appears, noticing the blessing as it is happening, you are probably wondering, “What else is there?” The answer is difficult to comprehend for those who cannot see anything beyond their form. For the third and highest stage of enlightenment gives us the choice of thought at its purest. It offers the possibility of thought experienced without intermediary, material, so-called causes. It is synchronicity in context with the notion that we are thought, and that thoughts reside both within and outside of us. In this stage of enlightenment, we are able to see the obstacles on the horizon as simply “events” which we have a choice about. At this stage, we do not need to create or become caught up in the obstacles to have the learning experience. The negative-sounding “obstacle” is replaced by the more neutral term “event.” I talk about synchronicity in my free video series as well. The divine part of ourselves which I have labeled thought and God is a force in the universe which we are capable of tuning in to if we believe in it and if we are willing. In the purest stage of synchronicity, we have a choice about experiencing thought in form or in pure thought. We get an intuitive sense that to act or continue acting in a certain way is creating a forthcoming event. Inner intuition tells us that we are heading toward this situation and we sense we have a choice about whether or not we need to go down this road again. In pure synchronicity, we are able to bypass the experience in form by having the thought without the need to play it out in form. It is literally getting out in front of it rather than learning from it through hindsight or in the present moment. When we permit thought it synchronized flow, its passage as part of the perfection, without resistance or denial, it flows through naturally without need to manifest externally. We have the power to use our minds to make the present joyful, with our ability to use thought. Loss of a particular relationship is unbearable when there is no relationship to Self. This is the magic of synchronicity. The traumas and obstacles are truly the events to enable us to understand, to know the Self.